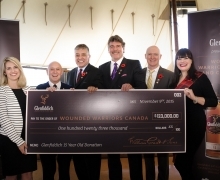 Toronto, ON – Glenfiddich, the world’s most awarded single malt Scotch has donated $131,616 to Wounded Warriors Canada, the largest single donation amount Wounded Warriors Canada has received to date. The donation is a result of an ongoing fundraiser where two dollars for every bottle of the Glenfiddich 15 Year Old Solera sold across Canada is provided in support of Canada’s wounded or injured soldiers and reservists. The record-breaking donation was presented to an overjoyed Phil Ralph, National Program Director of Wounded Warriors Canada Wednesday at the Moss Park Armoury in Toronto, Ontario. Ralph was joined by members of the Wounded Warriors Canada community, servicemen and women from the armoury and Glenfiddich representatives. 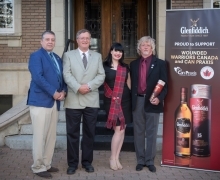 Glenfiddich’s fundraising efforts for Wounded Warriors Canada began in October 2012 with a record-breaking charity auction of an ultra-rare bottle of Glenfiddich 55 Year Old Scotch. The “Janet Sheed Roberts Reserve 55 Year Old” set the record as the most expensive bottle of whisky sold at auction in Canada, selling for $52,000 CAD. Glenfiddich plans to continue donating $2 from every bottle of Glenfiddich 15 Year Old Solera across Canada into 2014 and beyond. Glenfiddich and Wounded Warriors Canada are both considered pioneers in their fields. Glenfiddich remains family owned and operated for over 125 years, championing the development of the Single Malt Scotch Whisky business and established the unique Solera process for creating the Glenfiddich 15 year Old. Wounded Warriors Canada are the number one independent military charity in Canada with a primary focus on mental health and offers Canada’s first-ever Veterans Transition Program. They also offer pioneering programs like the Elite Service Dog Program and the life-changing Big Battlefield Bike Ride.